Before playing Alan Wake, I found the comparisons between it and Heavy Rain to be fanboy nonsense. It seemed as though the two games were being lined up together merely because they're exclusives to dueling consoles and neither stars space marines. In truth, though, the two games have something big in common: their mission. They aim not only to be fun but also to tell a story that's on par with artistic works in other mediums like film or television. Wake executes this plan in a very different way than Rain, though. The titular character is a best-selling novelist now afflicted with writer's block. Alan and his wife Alice decide to take a vacation in the sleepy, rural town of Bright Falls in the hopes that, once removed from distractions, he'll be able to write again. However, shortly after the couple settles in, Alice is kidnapped by a Dark Presence which then proceeds to infect the town and countryside. Alan sets out to find his wife, all the while suspecting that this malevolent force is connected to a manuscript he doesn't remember writing. It's best not to reveal anything else about the plot because its numerous twists and turns are probably the best reason to play Wake. It's structured like a television show, with six episodes that each end with a cliff-hanger and begin with a "Previously On..." montage to catch you up on the action. Numerous surprises are embedded within those episodes, too. While Wake escapes one deadly situation after the other, the larger truth about the Dark Presence and Bright Falls is slowly revealed to the player. While many games tend to dump the entire plot on the player, Wake gradually doles it out bit by bit to provide incentive to keep playing. To give more weight to the story's events, Remedy Entertainment spends a lot of time developing the game's main and supporting characters. Though Alice is kidnapped early in the game, players get to know her better through flashback sequences. Expect to spend lots of time with the eccentric residents of Bright Falls as well. Though some characters feel a bit one-dimensional (the law enforcement especially), most of the cast felt vivid enough that you'd care if something happened to them. The game alternates between day and night scenes. During the day-time, the Dark Presence is kept at bay and Alan can investigate Alice's disappearance in peace. These sequences are essentially interactive cutscenes; you'll walk around and talk to a few characters and maybe pick up an item or two. While it's less passive than an actual cutscene, it seems like more could've been done with these sequences. Heavy Rain, for example, made every scene into a sort of challenge even if there wasn't any "action." I'm not suggesting Wake should've had a diaper-changing scene but it would've been neat if, during the day-time, players' skills were tested in some manner. Come to think of it, this mirrors my complaint about the Splinter Cell: Conviction interrogation scenes: if you're going to make a exposition scene playable, give us something to actually play. Once the plot's been sufficiently advanced, the sun goes down and the Dark Presence comes back with a vengeance. The sunny, wooded countryside of Bright Falls becomes a menacing place. Nearby trees sway and collapse for unknown reasons. The Dark Presence takes over townspeople and bids them to kill Alan. Using whatever weapons he can find, he must fight them off and escape to safety until daybreak. 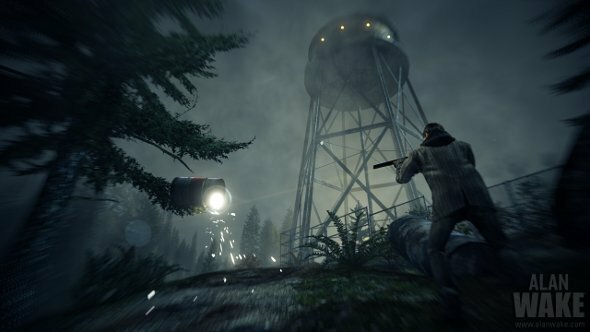 The night-time scenes are really the "core" Alan Wake experience, a mix between survival horror and third-person shooter. The twist is that it's impossible to kill these enemies ("The Taken") by simply shooting them. The Dark Presence forms a sort of protective barrier around them that needs to be removed before they can be damaged. Alan accomplishes this by hitting them with light, usually from his flashlight. He points his flashlight wherever his gun is aimed and will slowly wear down the Taken's defenses over time. The status of the Taken's darkness shield is indicated by a shrinking circle at the point where the flashlight's beam hits their body. To speed up the process, the player can hold down the left trigger button to put his flashlight on full blast. This, however, drains the flashlight's power and can only be done briefly before a recharge is needed. Recharging is a matter of popping in a new battery (Alan has a finite supply) or waiting several seconds for the power meter to regenerate. Once the Taken's defenses have evaporated, Alan's free to gun them down. In the earliest stages of the game, where enemies come in a slow trickle, this light mechanic felt like an unnecessary complication of standard shooter gameplay. It was just drawing out the fights unnecessarily. However, once I started taking on groups of Taken at a time, I understood the point. The need to wear down an enemy with the flashlight before killing it prevents the player from "spray and pray" tactics. 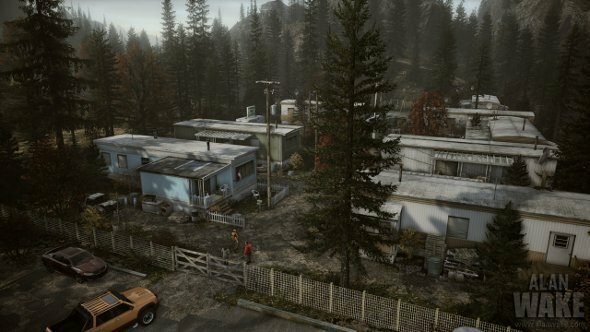 While Alan does acquire items that let him kill groups of enemies at once (flashbang grenades and a flare gun, the latter of which is sort of like a rocket launcher against these foes), most kills will be performed with single-shot weapons (revolver, rifle, shotgun). When confronted with several enemies at once, the player will have to dance around their attacks like a boxer and take them out one at a time. The flashbang and flare gun each have a small blast radius so drawing the Taken together into a tight group is a sort of challenge in and of itself. The principal issue with combat seems to be enemy diversity. Most types of Taken vary from each other in only superficial ways: their clothing, the type of melee weapon they wield, and how many hits it takes for them to go down. The only stand-out is a super fast variety that zips around you in a blur, and those guys only start popping up until the end. The driving sequences scattered throughout the campaign don't present any new combat challenges, either. They just result in the Taken becoming easy roadkill. For variety, the game falls back on two other kinds of enemies: inanimate objects and birds. The Dark Presence can act like a poltergeist and bring crates, pipes and other mundane items to life. It's an idea that sounds a lot scarier on paper. Dodging animated cable spools seems a bit tame compared to battling the insane Taken. The birds are a more nerve-wracking foe, as you have to scan the entire sky to spot their approach. The issue with them is that they should've been used more sparingly. It's not possible, though, as there's not enough other types of baddies in the game to toss at you. I played through the game on Normal difficulty but if you want an experience closer to "true" survival horror, you should probably consider the Hard or Nightmare settings. The game really offers up a lot of ammo on Normal. At a few points Alan loses his flashlight and/or weapons but other than that, scarcity isn't really an issue. I often switched weapons not because of a shortage of bullets but because I wanted to work on a different Achievement or because I had maxed out on a certain type of ammo. You can carry a maximum of 20 flashlight batteries and, as I said, the flashlight's charge slowly regenerates over time so there's no issue there, either. Higher difficulties force you to conserve supplies and find Taken a bit more daunting. You'll end up running away more often, and these moments are really the scariest parts of the game. Alan can only sprint in brief spurts before needing to rest and the Taken are faster than him. Furthermore, the camera is close on Alan's back so you really can't see enemies behind you. The times when you're racing to a well-lit area (which serve as checkpoints and ward off any nearby Taken) can be quite hair-raising. Remedy Entertainment's last two games were Max Payne and Max Payne 2 so you might expect Wake to feel too much like a shooter. Still, the game seems to take the right lessons from that genre. While there's an admittedly small number of items available for Wake to use, they're all bound to D-pad keys for easy use. Alan's health regenerates over time (and quicker in lit areas), which bypasses the need for an inventory screen (with medkits, green herbs, and that jazz) altogether. Even with these moves toward action gameplay, though, Wake makes a few concessions to the survival horror crowd. For example, there's no crosshair or zoom to help you guide your shots. The aggregate result of these design decisions is that Wake's controls are smooth without letting you be Master Chief. My play-through of Wake took about 11 hours. This number could vary a lot from player to player, though. Though the game is mostly linear, there's a bit of room for exploration. I've heard that the game was once supposed to be sort of a sandbox, and you seem remnants of that mission in the extras scattered throughout the map. If you travel off the beaten path, you'll probably find one of four different types of Easter eggs. For example, throughout the game world are over a dozen TV sets that play unique episodes of a "Twilight Zone"-ish show. There's also the hidden pages of Alan's mysterious manuscript, which offer hints of upcoming plot events in the game and also narrate action happening off-camera. Some of the other Easter eggs are less rewarding - the coffee thermoses are simple collectibles - but they've each got Achievements so you might find them worth the effort. 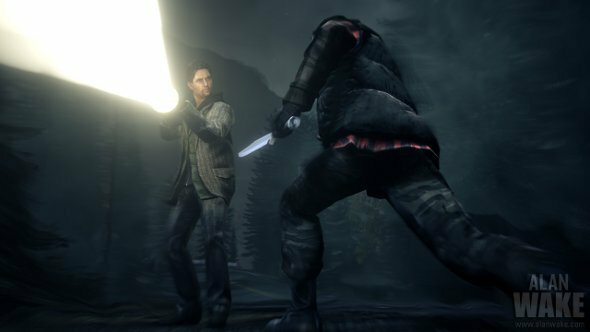 Alan Wake tries to straddle two genres and tell a very ambitious story in the process. The finished product has some rough components and might not do everything that Remedy hoped for when they first announced the game at E3 2005. Still, Wake tells a good tale in a medium that's often starved for original stories. It also offers up good reasons for action and survival horror fans to give it a serious look.